This is my first Neil Gaiman book! 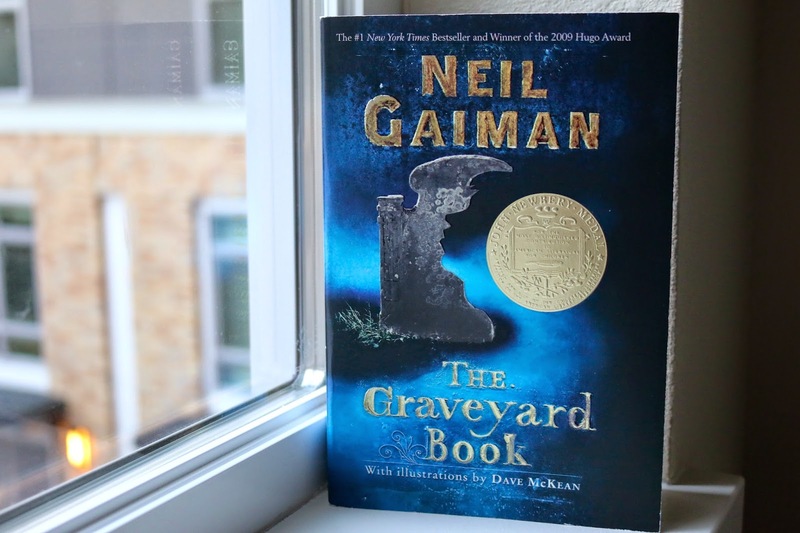 The Graveyard Book is about a boy, Nobody Owens, who is adopted by Mr. & Mrs. Owens (two ghosts) and raised by the other graveyard inhabitants collectively. His guardian, Silas, organizes his schooling and how much contact he can have with the outside/living world. Bod is hidden from the outside world because the man who killed his family is still looking for him. We see Bod grow up: he meets a little girl around age 5 and is best friends with her until her parents move; attends a public school as a teenager; and finally grows up enough to look for life outside the graveyard. This story is so beautifully written. Once I realized that ghosts in a graveyard in such a casual, day-to-day way is a large part of the story the story I became so excited. It is so unusual to have ghosts featured in such a way. Though the ending may have made me cry, I wish there were bookstores full of other books like this one. This was the first book I read in 2015. I started it on January 1st and I ended it on the same day. This book turned out to be a fantastic start to my year because I haven’t stopped reading yet!